Governor Terry Branstad led a meeting this morning in Washington, D.C. with seven other governors and a top Pentagon official. On Wednesday Branstad authorized any additional security meaures the head of the Iowa National Guard might believe are necessary for Guard facilities in Iowa. 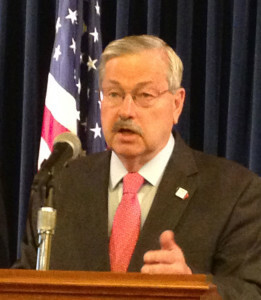 Branstad is co-chair of the Council of Governors that advises the Pentagon on issues related to the state guard units around the country. Branstad said military officials indicated they plan to present a report and recommendations to the U.S. Defense Secretary when he returns from a trip to Iraq. Private citizens with weapons have begun patrolling military recruitment centers around the country, and in Iowa, after last week’s fatal shootings of five soldiers in Tennessee. Branstad said with Islamic militants using social media to encourage attacks on American soldiers wherever they may be, governors want to “collaborate” with the Pentagon to enhance security of National Guard and regular military installations around the country.